The Catholic Multicultural Center’s programs and services depend upon the many helping hands of volunteers like you! 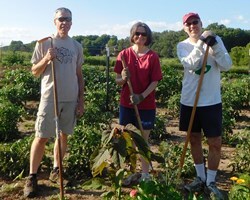 The CMC has volunteer opportunities for all ages and abilities for both individuals and groups. Ready to get involved? The first step to volunteering is to meet with the Volunteer Coordinator to receive a CMC orientation and fill out a volunteer application. Contact Laura Green using the staff contact form or call 608-441-1180. You can also see a listing of available positions on Volunteeryourtime.org. If you are required to do court-ordered community service, volunteer opportunities are available. For court-ordered volunteering, contact Antonio Quintanilla using the staff contact form or by calling 608-441-3249. Read these guidelines below, then contact the volunteer coordinator to discuss what options might be a good fit for your group. Please contact us at least two weeks in advance to arrange group opportunities. Volunteering must take place during normal hours of operation. The maximum group size is no more than 10 for helping at the CMC and no more than 15 for helping at the food pantry garden. If you have a larger group, contact us in advance to see if arrangements can be made. Groups of all ages are welcome, with some restrictions. Groups age 18 and under must come with at least one adult supervisor per 6 youth. For serving in the meal program, we can only accept groups age 12 and older. 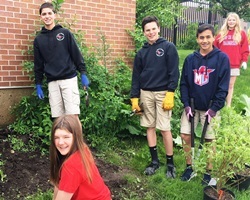 The primary opportunities for groups to volunteer at the CMC are: helping at the food pantry garden (May-September), serving a weekday afternoon meal, or doing cleaning, organizing, and light maintenance projects throughout the Center. Food drives, advocacy on issues affecting our guests, personal essentials drives, and other creative ways your group can help the CMC are also appreciated! Please note that not all positions have immediate openings.